This post is sponsored by The Mediterranean Diet Cookbook. All opinions are my own. When I first got my copy of Idiot's Guides: The Mediterranean Diet Cookbook I couldn't get over how many healthy and simple recipes there were to choose from... which to make? 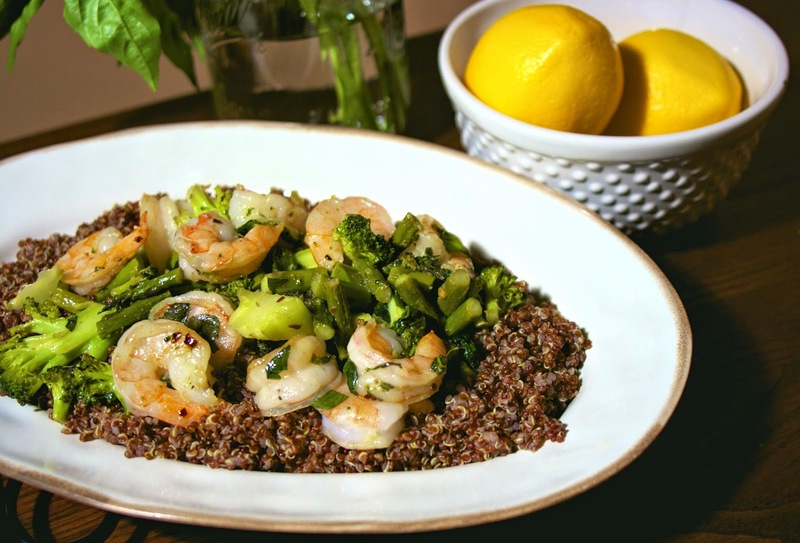 I picked this Basil and Shrimp Quinoa recipe because I don't recall ever cooking red quinoa before.. I didn't realize that there are different types of quinoa. The fad diets right now tell you to eliminate so many things from your diet. You may loss weight this way, but what are you doing to your health by avoiding food groups? Unless you have allergies or a diagnosed alignment, studies time and time again have shown that the Mediterranean diet is one of the healthiest on the planet. You can't go wrong nutritionally by eating a diet primarily of fruits, vegetables and whole grains with fish, poultry, and legumes as your primary sources of protein with occasional helpings of red meat, and small amounts of dairy, all cooked in heart healthy olive oil. Idiot's Guides: The Mediterranean Diet Cookbook explains in simple terms the health benefits of eating a Mediterranean diet along with easy recipes that will help you plan all of your meals from healthy breakfasts to satisfying desserts. Enjoy this sample recipe from the cookbook and give a tried and true healthy way of eating a go! 1) In a 2 quart pot over low heat, heat extra-virgin olive oil. Add garlic, and cook for 3 minutes. 2) Increase heat to medium, add broccoli and asparagus, and cook for 2 minutes. 3) Add chicken broth, salt, black pepper, and lemon zest, and bring to a boil. Stir in red quinoa, cover, and cook for 15 minutes. 4) Fold in basil and shrimp, cover, and cook for 10 minutes. I made half the quinoa but the same amount of everything else. I used the cooking instructions on the quinoa box and made it with the chicken broth. I sautéed the rest of the ingredients in the olive oil and put it on top of the quinoa. It's a good diet/way to eat. It isn't boring, you get to have everything, just smaller amounts of dairy and red meat. I got the red quinoa in a health food store, have not seen it in a grocery yet. 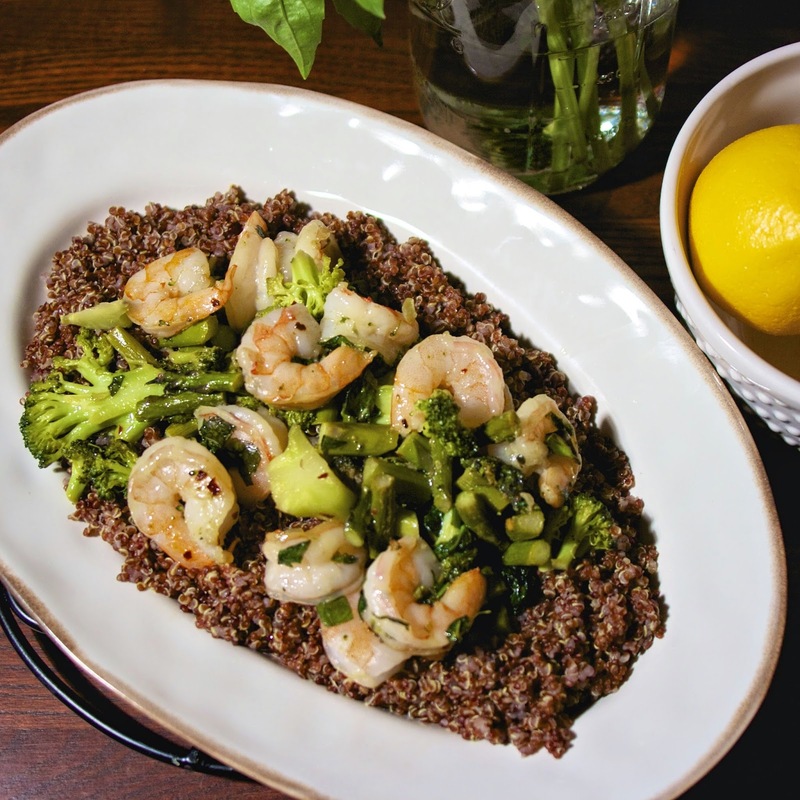 We've recently discovered red quinoa this year and love it. A person on Google+ recommended black quinoa.. I wonder if it tastes much different? I really loved the red quinoa too. I make red quinoa frequently, but I do prefer the white. I just wanted to let you know that I participated this week in The Virtual Tour and I am passing the Baton on to three other bloggers. You are one of them. Please visit my blog to accept the Baton.. I didn't know there were different types of quinoa either. I like the deep color of this one. Thank you for sharing, Diane. 1. This looks sooooo delicious! 2. I didn't know there were different types of quinoa. 3. Thanks for sharing this recipe, I can't wait to try it.